Growing up in Indiana, I ate a LOT of corn – and loved it right off the grill! I can still remember the State Fair where they would dunk it in a big barrel of butter and slather it in salt. But THIS recipe for Vegan Mexican Street Corn – with a Cilantro Lime marinade and smothered in Vegan Parmesan? …. Oh man, we’re taking it to the ridiculous level now! As the kids like to say, this stuff is the “Bomb dot com”! I seriously have an entire list of brand new recipes I want to try and veganize for the grill. And it seems to get longer every day when I see something else I want to try! And this Vegan Mexican Street Corn was way up at the top of that list! Now, the photos you see on the Internet show Mexican Street Corn smothered in a mayonnaise/sour cream mixture and then rolled in some kind of Mexican Cheese. And while I’m sure THAT is amazing too…..it’s also VERY FATTENING! Can you say massive CALORIES? So I made mine a little bit differently, attempting to still get that same great Mexican flavor – but while keeping the calories to a minimum. Seasoned Almond Milk serves as the base for my marinade while my Vegan Parmesan gives it that tangy, cheesy flavor. 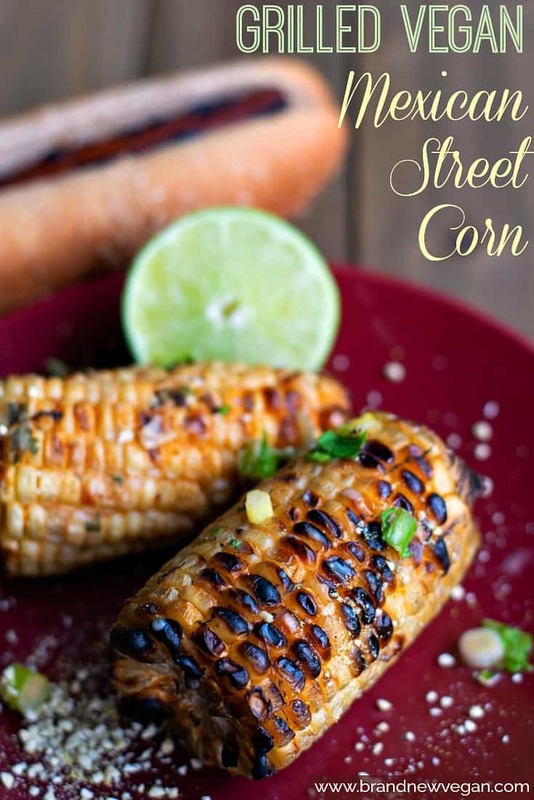 Authentic Mexican Street Corn? Absolutely not. But Vegan? With no oil or added fats, and less calories? You betcha. And taste? I’ll let you be the judge. Let’s go fire up the grill and find out. I used 3 ears of Sweet Corn I bought in my grocery store. Remove the husk and silk and clean them up and while not absolutely necessary – I broke mine in half for a total of 6 small ears of corn. Place these in a large bowl and set aside. For the marinade mix 1 cup of Unsweetened Almond Milk, a couple of chopped Green Onions, a small handful of chopped Cilantro, a good heaping teaspoon of Smoked Paprika, a little ground cumin, chili powder, and a dash of salt, pepper, and dried Thyme. For you Cilantro haters out there: Fine, you can use chopped Parsley instead. Mix the marinade ingredients and then pour over the corn. Make sure to stir things around every now and then to make sure all of the corn pieces get some marinade and let that sit for at least 1 hour (if not longer). Q: What can I substitute for the Cilantro – I hate it. Q: Can I cook these in an oven? A: Maybe – but you won’t get that great smokey flavor, grill marks, or char. Q: Can I cook these on a grill plate or George Foreman Grill? A: Maybe – but I have not done it myself. Q: I’m allergic to Cashews, what else can I use for the cheese? A: I made a Vegan version of Queso Fresco in my Chilaquiles Recipe – maybe give that a try. Q: Can I precook my corn on the stove or microwave to reduce grilling time? A: Sure thing. Actually, not a bad idea at all. Now why didn’t I think of that? Oh – I just did. Ok – prepare your grill for both indirect and direct heat. I used the direct heat to get those yummy char marks and then moved them over to the indirect side to finish cooking. Be sure and baste with the remaining marinade occasionally as you give them a turn. And when they’re done, and juicy, and all golden and slightly charred just the way you like it…. squeeze on a little fresh lime juice and give it a generous shake of the Vegan Parmesan. 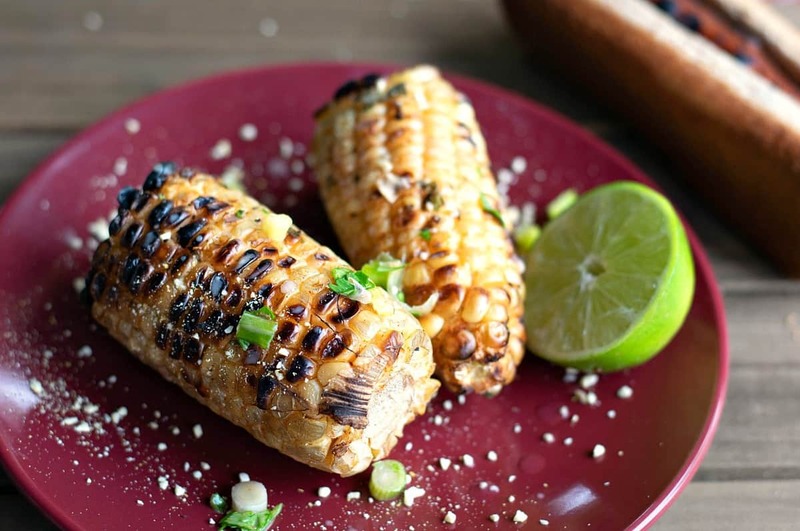 There you go – Grilled Vegan Mexican Street Corn. Hope you got plenty of napkins. 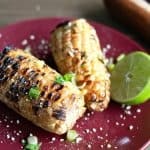 Another summer BBQ favorite - Grilled Vegan Mexican Street Corn! Instead of using the traditional mayonnaise rub I did something a little different to reduce the fat and calories. And with a shake or two of my Vegan Parmesan - perfecto! (Be sure and grab plenty of napkins). Mix all marinade ingredients and pour over corn. Allow the corn to marinate at least 1 hour (longer is better) and turn pieces often to ensure they get covered. Grill over direct heat to get those lovely grill marks and then move to indirect heat to continue cooking until juicy and tender. Baste with remaining marinade often. Serve with freshly squeezed lime juice and Vegan Parmesan. I can’t really give you an exact time, as it will depend on what kind of grill you’re using (gas or charcoal), how much charcoal, how close to the heat it is, etc. I would say just watch it carefully and when it starts to brown a little, flip it over to another side and continue cooking until it’s as charred as you want. Made this tonight – very good blend of flavors. Didn’t use the vegan Parmesan – it was very good with just a squeeze of fresh lime juice. Thanks for sharing! Since it hAs been proved that charring foods contributes to cancer, I would not choose to ezatwhat is shown in the photo. Remove from grill before itbkackens. Harmful PCA ‘s and HCA’s don’t form on grilled fruit or vegetables so you don’t have to worry!! It’s only on grilled meats! If you DO chose to precook the corn, so you marinate it before or after cooking? I’m thinking if you boil it, cook it before so you don’t wash off the marinade. What would you think when microwaving it first? Thanks!